Tooth decay. Lasers are used to remove decay within a tooth and prepare the surrounding enamel for receipt of the filling. Teeth whitening. Lasers are used to speed up in-office teeth whitening procedures. A peroxide bleaching solution, applied to the tooth surface, is ”activated” by laser energy, which speeds up of the whitening process. Typical treatment for periodontal disease is scaling and root planing (SRP), which is a non-surgical method of cleaning the surfaces of the teeth and their root which may be exposed due to gum recession. This removes tartar, plaque and bacteria from the gum surrounding the root, and promotes the healthy regeneration of the gum tissue. Alternatively, the periodontist may perform gum flap surgery, where in the gum tissue is cut and flapped back to allow deep cleaning around the roots underneath. The gum tissue is then sutured back into place to heal. In periodontal laser therapy, the provider uses a dental laser to access and remove the inflamed gum tissue from around the root of the tooth. When the infected tissue is removed and the root is exposed, the root scaling begins. This involves scraping off the calculus and plaque built up below the gumline and around the root. The dentist then smoothens the root with instruments to remove any rough spots that might attract bacteria and cause future infections. The area between the gum and the root can then regenerate during the healing process. No general anesthetic is needed, as is sometimes required for other forms of dental surgery. Lasers can target the diseased areas precisely and accurately. Bleeding, pain and swelling are limited because periodontal laser therapy is less invasive than regular surgery. Recovery and healing times are shorter. For some patients, TMJ results in mild pain and slight impairment in jaw function, for others it can be severe. The majority of facial pain actually stems from TMJ disorders as the pain can radiate outward to the neck and affecting muscles and ligaments in the face. Often patients suffer from frequent headaches caused by inflammation of the muscles that are used to open and close the mouth. Laser treatment uses light photons (energy) to penetrate deep into the tissues surrounding the temporomandibular joint as well as the joint itself. Laser energy decreases inflammation deep in the tissues that produces almost immediate relief. It also stimulates healing. The temporomandibular joint is unique in the body as it regulates two motions; up and down and side to side. The muscles that support and cross the joint create force on the joint and can become inflamed for a number of reasons. Laser treatment for TMJ gives patients immediate pain relief producing a feeling of warmth at the deep site of pain. Other than pain relief, laser therapy has other health benefits which can contribute to long term healing. Initially laser treatment reduces inflammation and enhances tissue healing by stimulating the production of more red blood cells in the area. Laser therapy also increases lymphatic movement and increases oxygenation of the damaged tissues which in turn cause them to regenerate healthy cells. Another reason to have laser treatment for TMJ is that laser energy stimulates an enzyme present in all cells to produce more energy which in turn speeds up the healing process. Laser treatment for TMJ pain is painless, non invasive and has health benefits that far exceed any relief provided by a drug. Biteguard appliance- It’s a silicon appliance used to train the TMJ and muscles involved in opening and closure of the jaws. It’s a custom made appliance which is to be worn by the patient mostly for the lower jaw and rarely for the upper jaw who face difficulty in opening mouth wide open or who suffer with jaw pain or those who have teeth grinding habit causing attrition of teeth and trauma to the TMJ. Our goal is to revolutionize the way we practice dentistry. To achieve this we always strive to provide the best dental technology to our patients. With Biolase laser we are able to accomplish dental procedures faster than ever, with less pain, less bleeding, and faster healing. 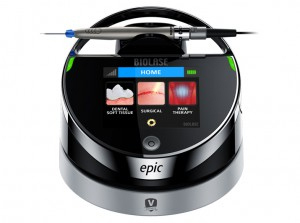 In dentistry, the EPIC diode laser is the only laser with three therapy modes: soft tissue, whitening and pain therapy. What makes laser dentistry so popular with patients is the simple fact that less anaesthetic and damage to the tissue is caused, resulting in more patient comfort and quicker healing. These lasers can be used to recontour the gums to improve the symmetry in your smile. In case of Gummy Smiles, this laser is used to remove excess gum tissue, exposing more of the healthy tooth for a beautiful smile. Used in treating lesions, ulcers and benign soft-tissue growths. Treatment of gum disease can be easily done by eliminating infected pockets. This can help in stopping the gum disease and preventing it from re-occurring . They are very precise and minimally invasive which reduce pain during and after the procedure. Used for Teeth Whitening – The laser is very powerful and can give fast results for teeth whitening. This is excellent to treat gum disease and has reduced the requirement of gum surgeries. Using the laser the diseased tissue can be removed and the areas sterilized from bacteria. This heals the diseased gums and prevents gums shrinkage normally associated with gums surgery. It has also revolutionized the treatment of gum conditions. In patients with gummy smile (showing too much gum while smiling) this laser is used to remove excess gum tissue. And the gums heal normally within 1-2 days. Another benefit is restoring teeth that are broken badly; they will have to be lengthened to provide adequate support to place a crown. Traditional crown lengthening surgery required a healing period of minimum 6 weeks before a crown can be placed. With the laser, we can now place the crown within ONE week. Dental Implants – Used in easy uncovering of dental implants. Tooth Sensitivity – They can also be used to reduce tooth sensitivity. Gum Depigmentation – Used to treat dark gums to make them pink. Procedure is minimally invasive and precise with no cutting and suturing. Discomfort is considerably less during and after surgery as compared to standard surgeries. Shrinkage of the gums is minimal, following the treatment as compared to the traditional surgery. Faster recovery time – normally within 24 hours.